Recently, I was asked to design a baseball themed party for a six year old boy, Anderson. 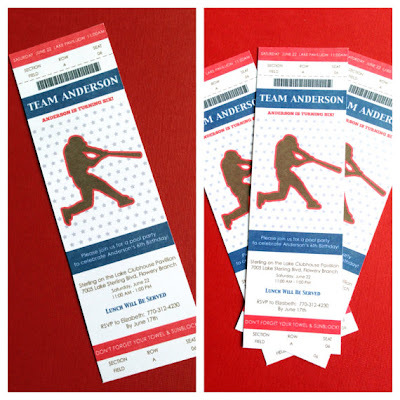 The invitations were designed to resemble baseball game tickets, and served as the inspiration for the rest of the party decor. For this party, my client Elizabeth wanted a customized banner, which was hung on the mantle in the outdoor pavilion of the neighborhood clubhouse. 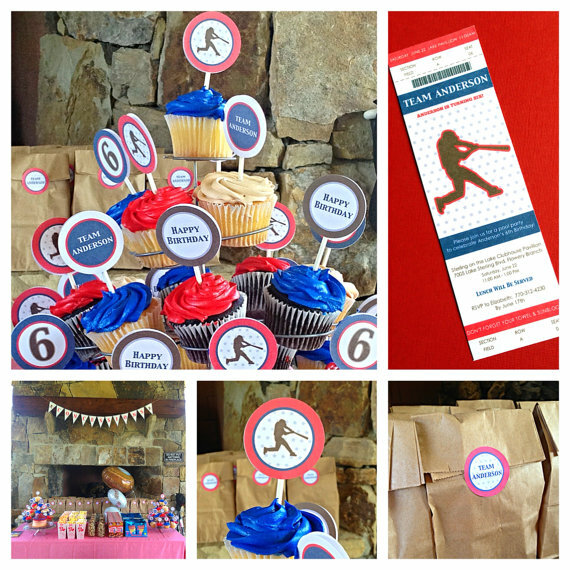 Also included were a variety of cupcake toppers, stickers for the favor bags, and water bottle labels. The party came out so cute! 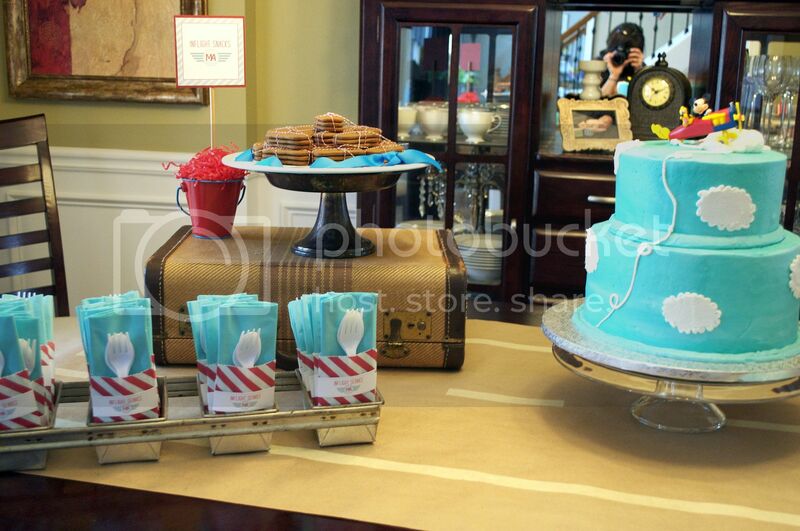 Elizabeth did a fabulous job setting everything up, and the guests all loved the creative theme! Hope you had a wonderful birthday Anderson! Posted by Jennifer at 9:53 AM 2 I would love to hear from you! Party 101, Part 2 - Get Inspired! I hope you enjoyed Party 101, Where to Start! Now that you've got your budget set, theme picked out and you know where you want to have this shindig - what's next? For me, this is where I start getting inspired. The first place I turn is Pinterest. No matter what theme you choose, you can pretty much bet on finding loads of ideas - from color schemes to diy projects. 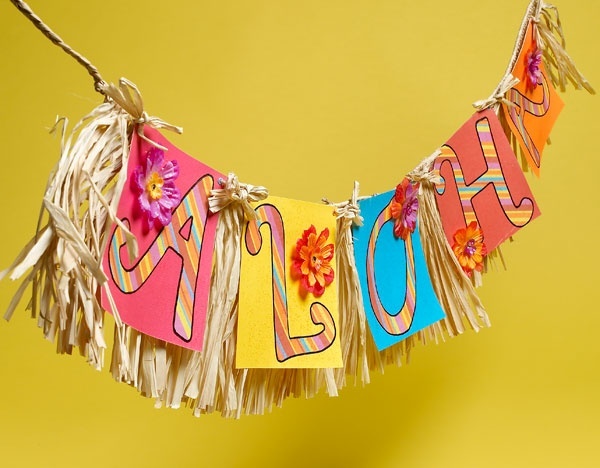 I knew for the luau, I wanted to stick with a bright color scheme - pink, blue, yellow, green and orange. This theme has been done many times over, so I knew there would be some great eye candy out there. It can get overwhelming, so try to only pin the ones that have specific elements that you think you would like to incorporate in your party. For me, it was bright colors, hibiscus flowers and natural grass. I loved this thatch umbrella. 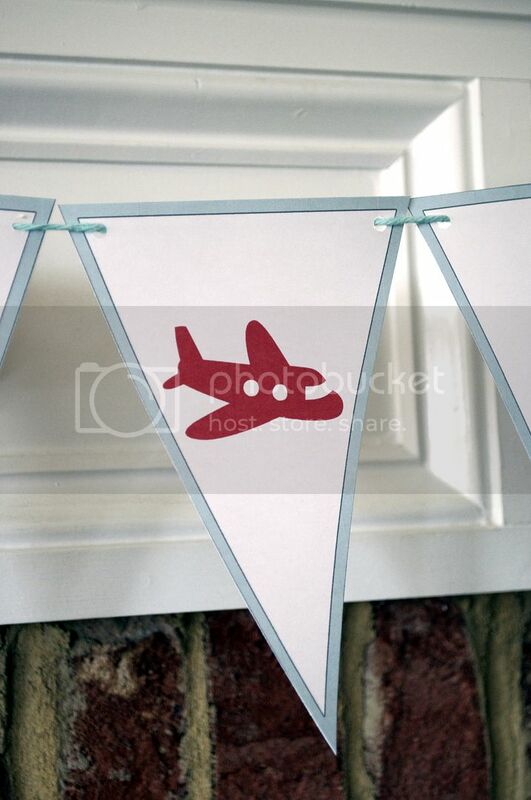 This banner inspired my color scheme, and gave me ideas on how to design my own! 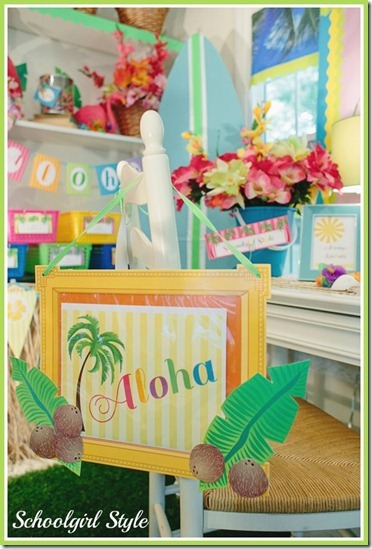 This classroom luau gave me loads of ideas for printable design files. 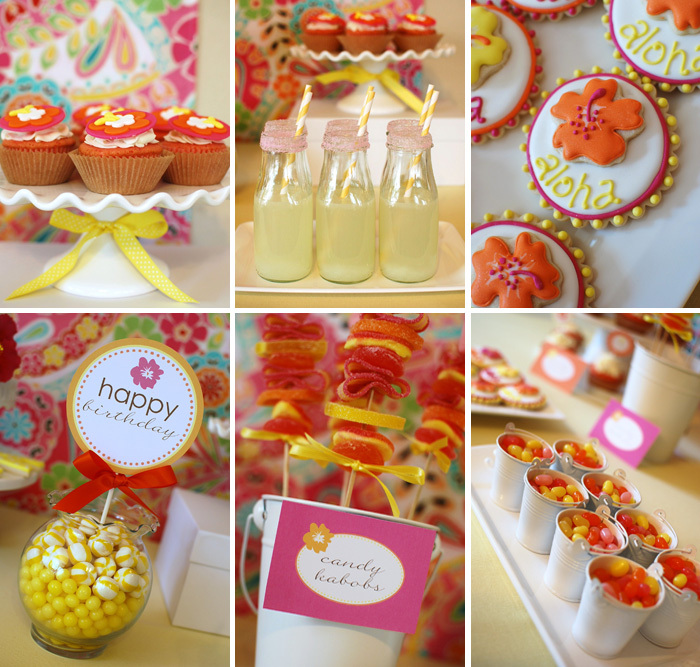 The bright colors and dessert table here were so adorable! Once you have a bunch of ideas pinned, you can look back through them and start to get a clear picture for what you want, and what you'll need. Consider the location (backyard for me), and layout of the party venue. 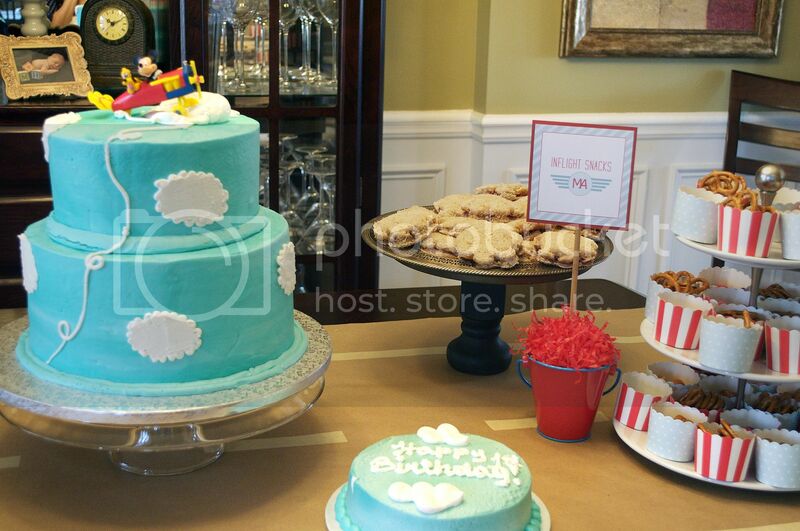 Will you have a food/dessert table? Is there somewhere to hang a banner? Get your wheels turning! 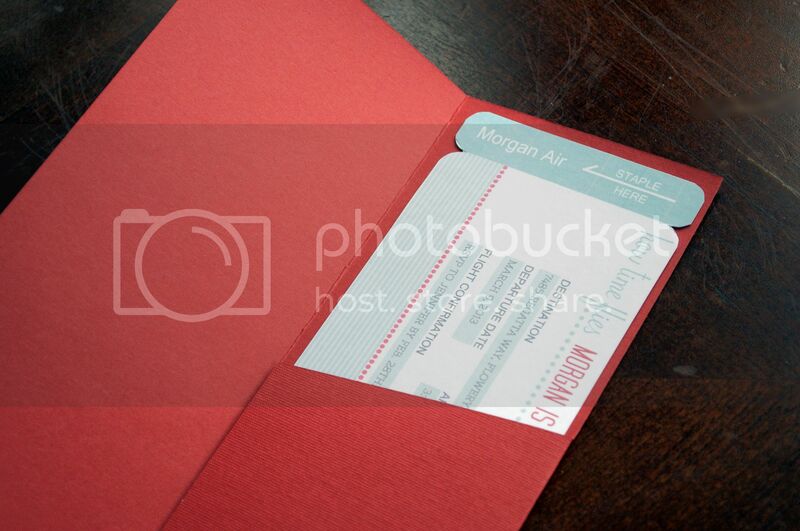 With the theme and color scheme decided on, now you can start working on invitations. I cannot stress enough how important invitations are - an actual invitation that you can hold in your hand. In the land of emails, it's so nice to get something special in the good ole' mailbox. Not gonna lie to you - I'm not a big fan of the evite. I know they're convenient, but to me, they're very impersonal. Take the time to show your guests that you went out of your way to invite them to something special. Not to mention - the invitation is the first impression they will have of your event - make it a good one! There are so many resources out there - from detailed and expensive, to DIY. 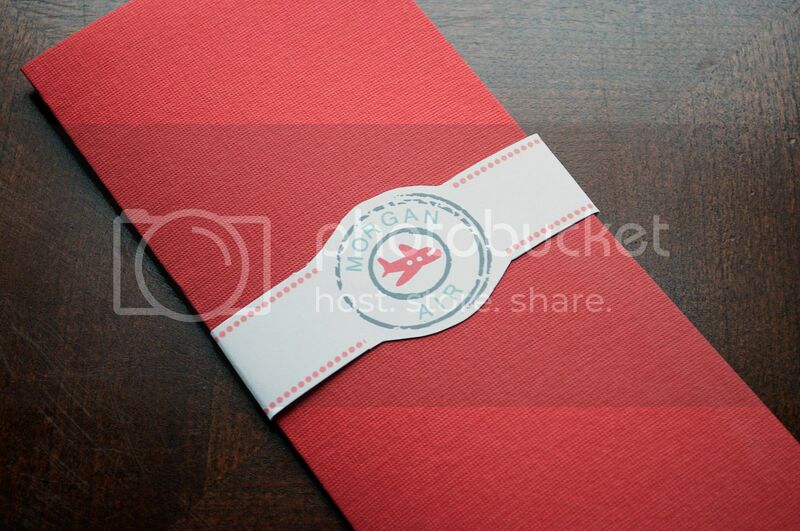 You can find invites that coordinate with your theme and won't break the bank. 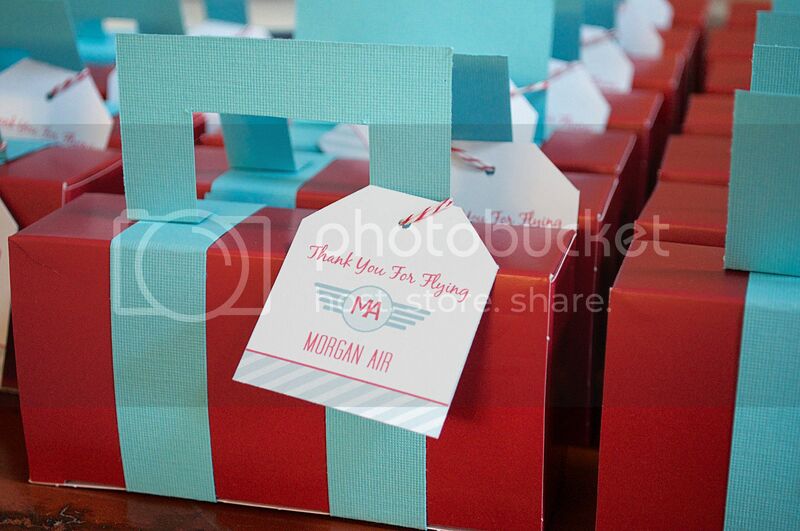 Head over to Etsy - I promise you that there are a million printable invitations in every theme imaginable. As a designer with my own stationery & printables shop - I can also tell you that most Etsy sellers will be more than willing to work with you if you find something you love, but need to customize it to another color, etc. 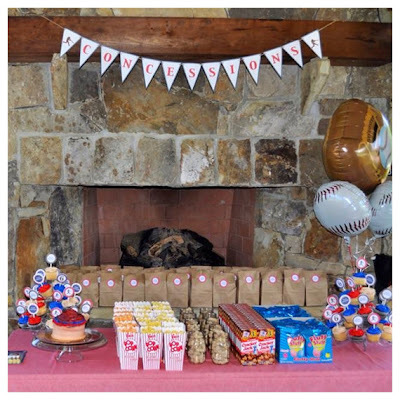 Printables are a snap - you get the file, customized with your party information, slip some cardstock in your printer, cut and go! No time? There are also shops, like mine, who will print them for you - even stuff them and design mailing labels that coordinate with your theme! Depending on your budget - there are a million different ways to go about decor. You can hire someone to do it for you, wipe your hands clean and sit back and watch it come together before your eyes (sounds nice, huh?). If you're the DIY type, printables may be the way to go - you can probably even find some in the shop where you ordered your invitations that match your theme! 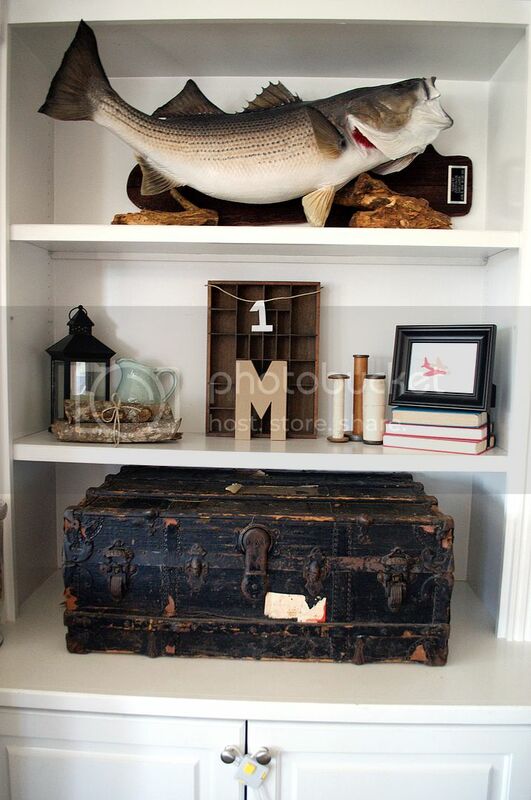 Just think about your space - it gets very easy (and expensive) to run to the local party store and buy more than you can use and still not have a pulled together look. 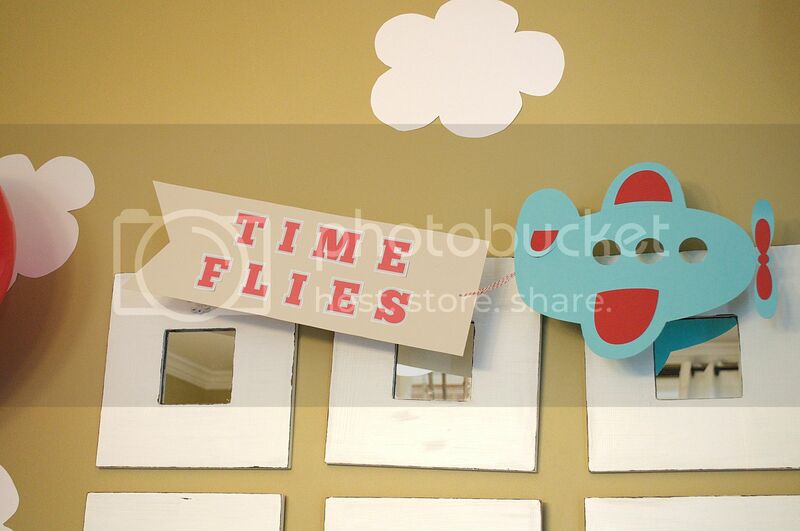 For Addison's party, I knew I wanted to hang a banner over the back door (like the one pictured above). 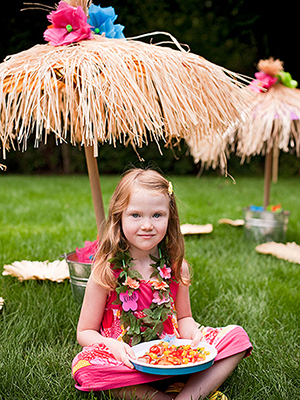 There was going to be a food table on the patio, and I wanted to set up a luau table in the yard for the kids to sit. This was my party framework. I went back to my pinterest board and was really able to narrow down what I needed. 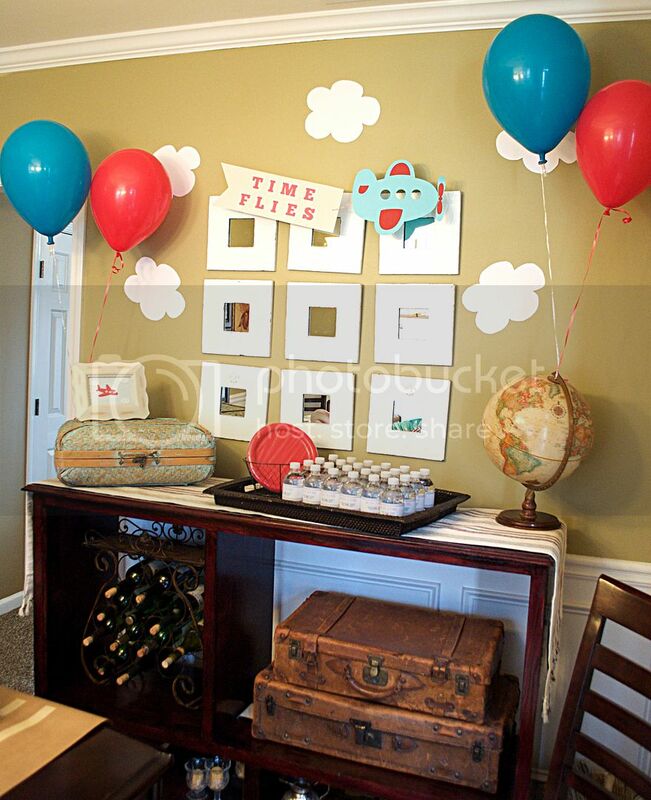 The best way to avoid making your party look like it came entirely from a party store, is to incorporate items that you may already have. Baskets, serving dishes, etc. - use what you can. 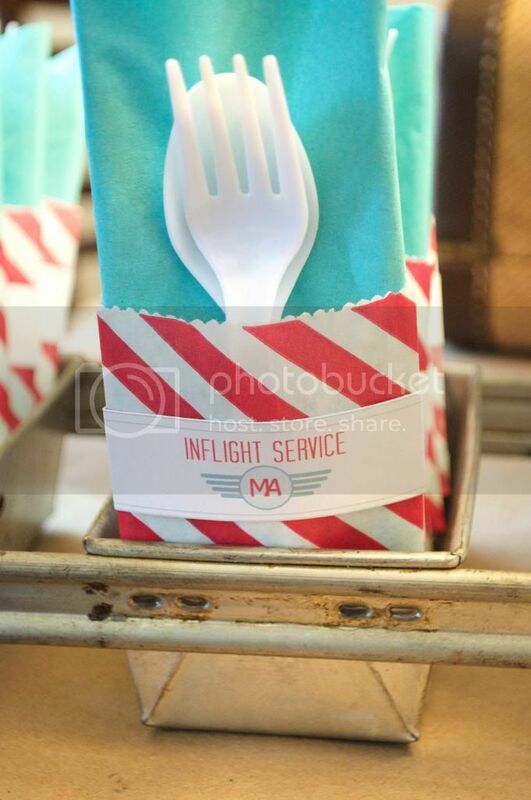 Using solid color paper plates, cups and utensils from the dollar store (all in the same color/shade) is a great tip for keeping with your theme, but not paying a premium for themed paper products. To me, it looks better anyway. As for the rest - since you're starting early - you can head online to price out everything and find the most cost efficient options. I'll be back soon with my final tips. Next time I'll talk about food, entertainment, and will share some resources on where to find some really cute stuff! Posted by Jennifer at 4:08 PM 0 I would love to hear from you! Party 101, Part 1 - Where To Start? I'm currently in the throws of planning Addison's 7th Birthday party, so I thought, Why not use this time (while its all fresh) to write a Party 101 Series? As a mom of two who works full time, I know that parties can be stressful and can overwhelm your already busy schedule (and wallet). Believe it or not, it can be fun, and relatively easy if you follow some key steps. 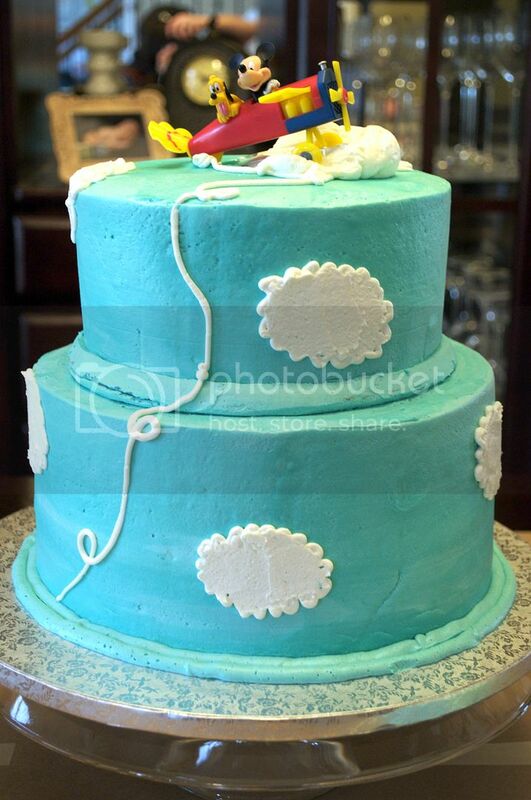 Whether its a birthday party, shower, engagement party or graduation party - the planning and execution process is pretty much the same across the board. 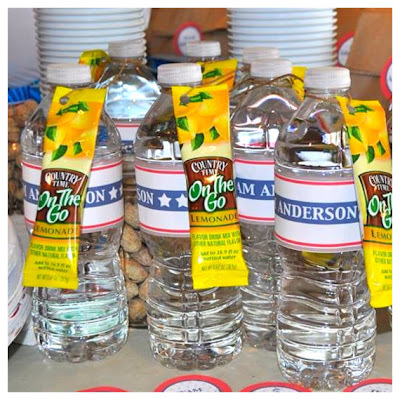 Using Addison's party as my example, I will take you with me, step by step on how to plan a party that's put together, will keep you sane, and leave your guests wondering how you did it all! Ready to get started? Let's Go! Before you begin, the number one thing you need to determine is how much you want to spend - in terms of both time and money. A piece of advice from personal experience - don't wait until the last minute! Whether you hire someone to design your whole party, or do it completely yourself, waiting until the last minute only makes it way more expensive. There are great resources out there for everyone, whether you want to DIY or not - as long as you start planning early. For the lucky few, cost may not be an issue, but for moms like me - being budget conscious is important. As we go, I'll discuss tips on how to save some of that dough. 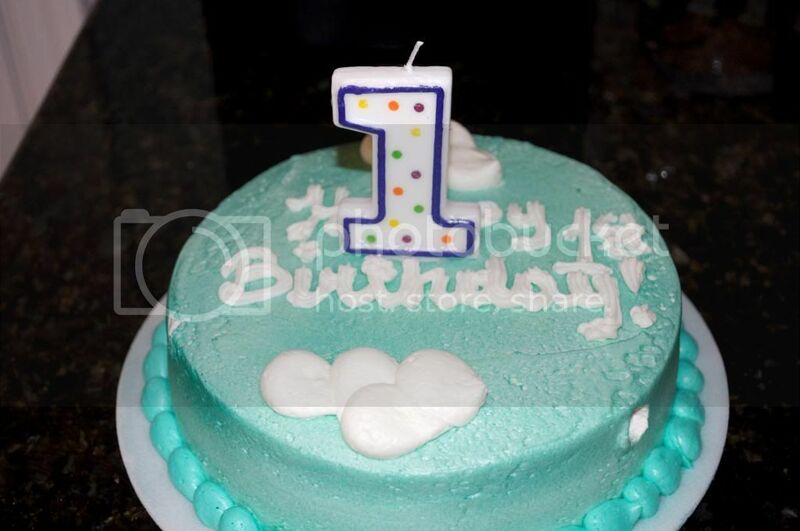 Addison starts thinking about her next birthday party as soon as the current one is over, and as the year goes on she changes her mind about a million times. I try to get her focused about two months out, and at that time, whatever idea she has in her head is what we go with. No more changing her mind. If your kids are too young to tell you what kind of party they want, or they can't decide, think about what they enjoy - it could be as simple as a favorite color, place, toy, TV show or activity. Having a theme in mind is the most important piece in pulling everything cohesively together. From here, you can start looking for inspiration and ideas (more on that later), and can pull a color scheme together. In Addison's case this year, we attended a family graduation party that had a Luau theme. She liked it so much, she decided that she wanted to do that for her birthday - done and done. Once the theme was decided on, I started thinking about where we could have it. We could spend a small fee and do it at a park, our neighborhood clubhouse or pool, or at a nearby marina. I knew I wanted to spend a little extra on the party entertainment, so this is one place where I decided to save. Why not do it at home, for free? Two years ago, however, Addison had a movie star themed party. Our neighborhood clubhouse has a small theater so I rented it out for a few hours - you get the idea. Another thing to consider when choosing a venue is time of year and weather concerns. An outside Luau in the middle of winter - probably not the best idea. Even for Addie's party this year, I have a backup plan to bring it inside if need be. You never know when a freak thunderstorm might come rolling through in the middle of July! Because of the backup, I have also limited the number of guests she can invite - only as many as can fit inside! 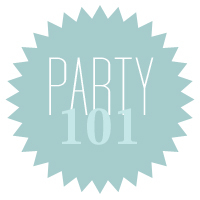 I hope you enjoyed the first installment of my Party 101 series. Next time I will talk about inspiration, invitations and party decor! Get ready to see some great eye candy!! Posted by Jennifer at 7:37 AM 0 I would love to hear from you! Two weeks before Morgan's Party we took a trip to Disney World. We had a wonderful time, but once we got back home I was in full party mode. There was a lot to pull together in a very short time. Luckily, I had sketched everything out before we left, so I had an idea, at least, for what I wanted to do. We had the party at our house, so I'll give you a little tour. 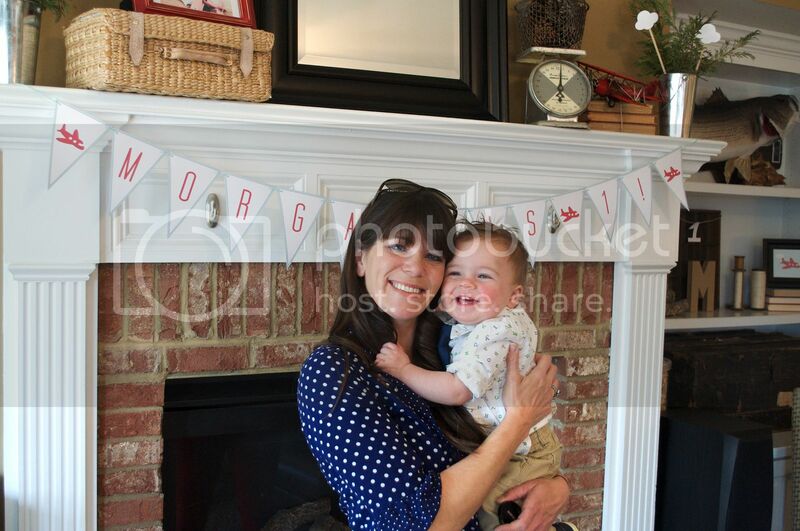 Forgive all of the bazillions of pictures, but I went a little nuts since it was Morgan's very first party! 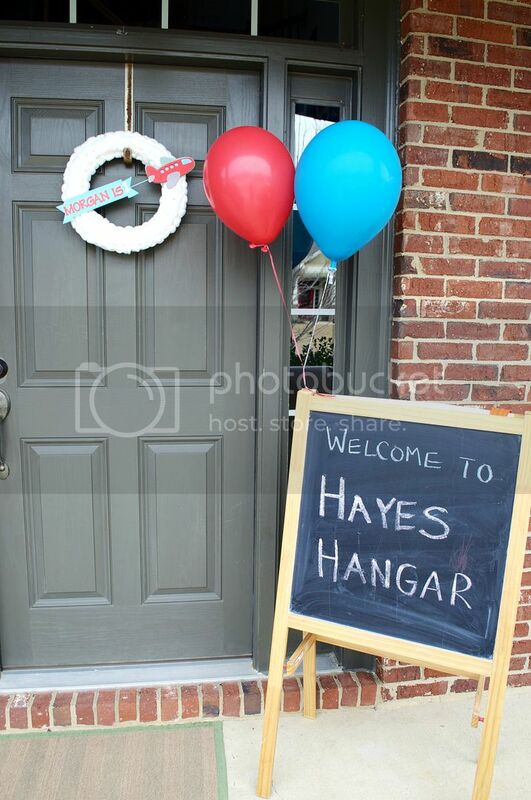 Welcome to Hayes Hangar! 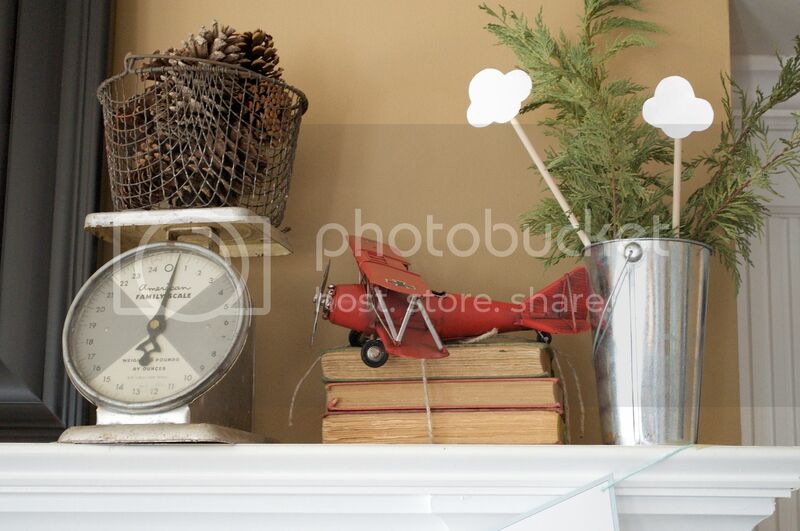 I had picked up the little wooden airplane at Hobby Lobby months before the party. It was kind of the catalyst of the whole idea, color scheme and all. 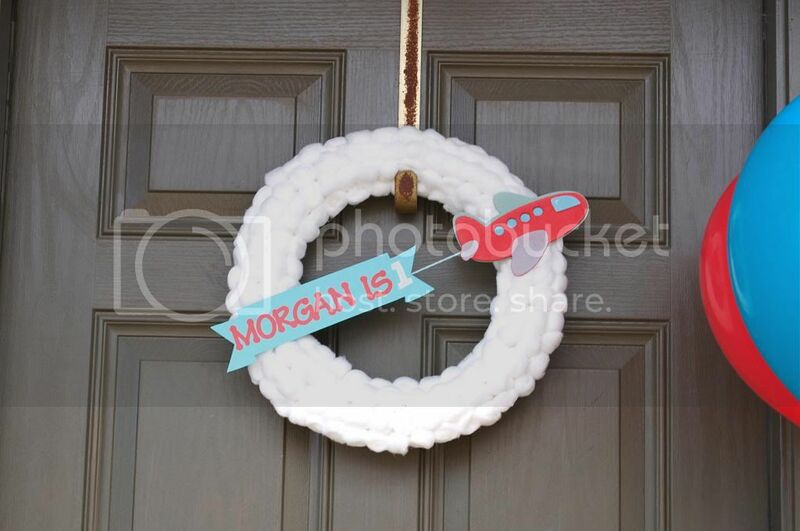 I knew I wanted to use it in something, so when I decided to make this cloud wreath, I knew it would be the perfect accent. 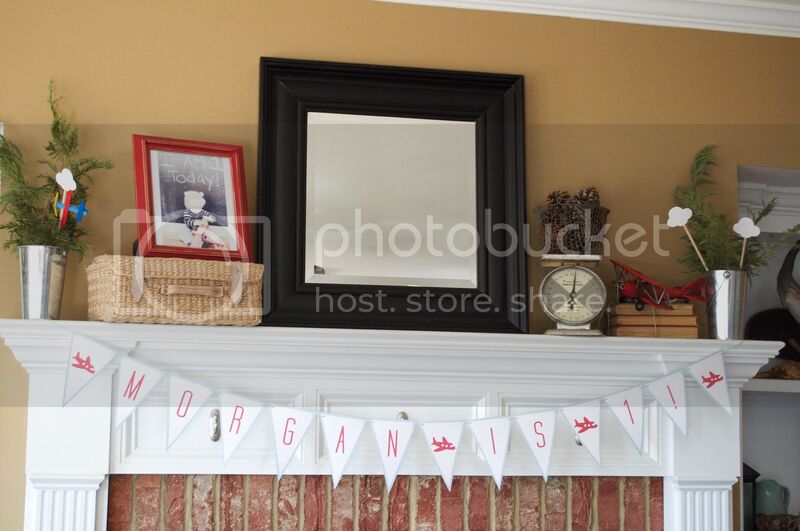 I used my cricut to cut out the banner and letters. The mantle was decorated with bunting that I designed to coordinate with the theme. I had taken a photo of Morgan wearing an aviator hat (so cute), so I added that in a frame with the little red airplane that he was playing with in the photo. I just wanted to use a bunch of things I already had in the house for the rest - no need to recreate the wheel! This was one of my favorite little things. 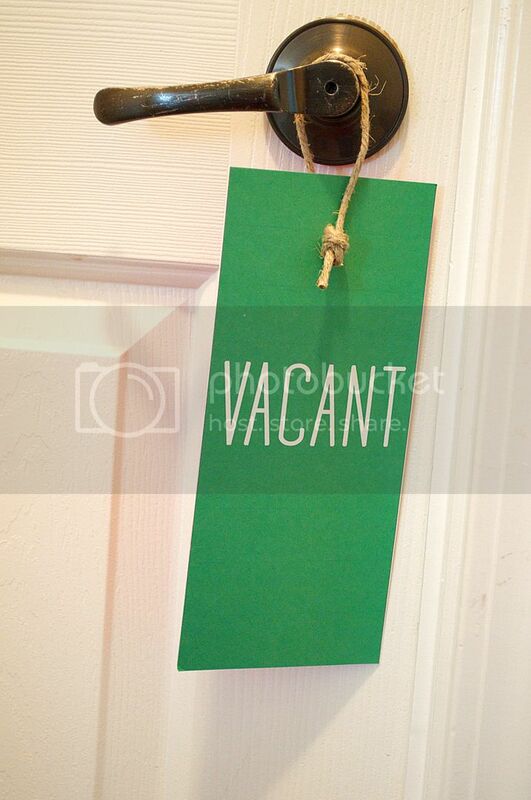 I made a sign to hang on the bathroom door handle. When the guests went in, they turned it around to the red side that said "occupied". Also, not pictured, I hung a sign on the mirror in the bathroom that said, "Please no smoking in restroom". My dining room was where all of the goodies were stashed. 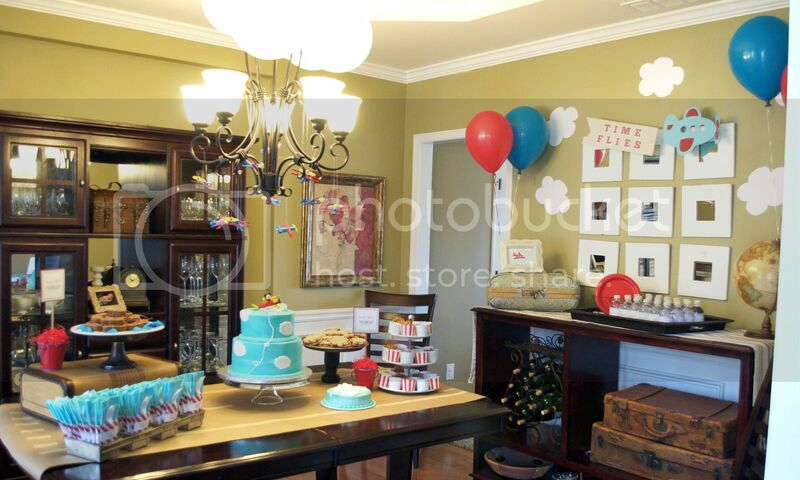 I decorated the buffet where I kept all of the plates and waters, and the table where the cake and snacks were. 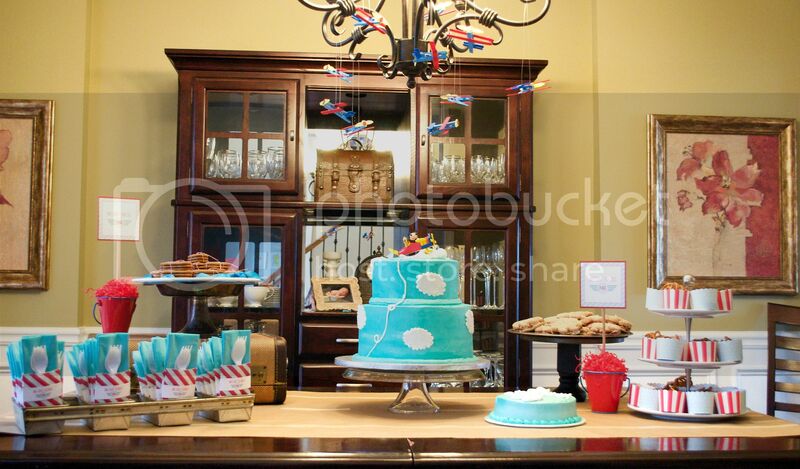 Originally, I was going to use the buffet as my "dessert table" and leave the table open for seating. When push came to shove, it was too small, so I expanded. The little tray with the cookie stack on top? 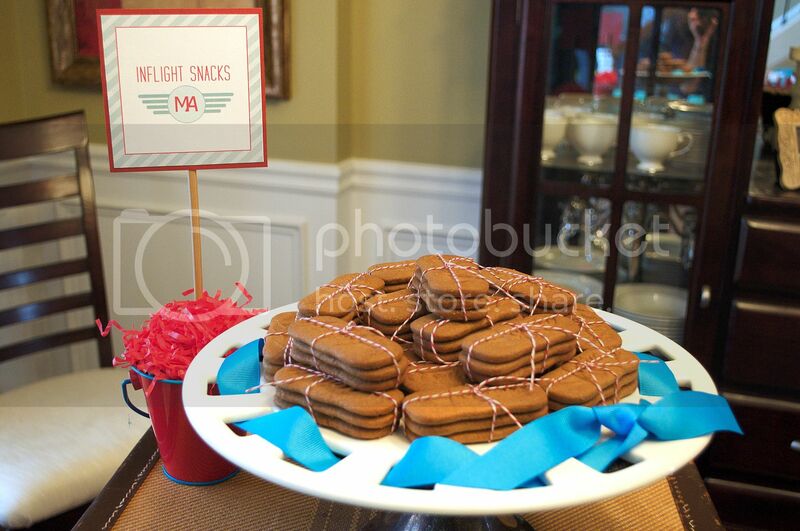 You guessed it, those are the Biscoff cookies they serve on flights. I tied them in little bunched to look like shipped packages! We had a bit of a cake dilemma. I had found one online that I liked, and my friend was going to make it for me. Two days before the party her whole house came down with the flu. I ended up going to Publix with my photo, and they were able to recreate it. They did a great job, and on super short notice! The only airplane they had in the house was this Mickey Mouse one. I just went with it. We had just returned from our Disney trip, so it seemed fitting. 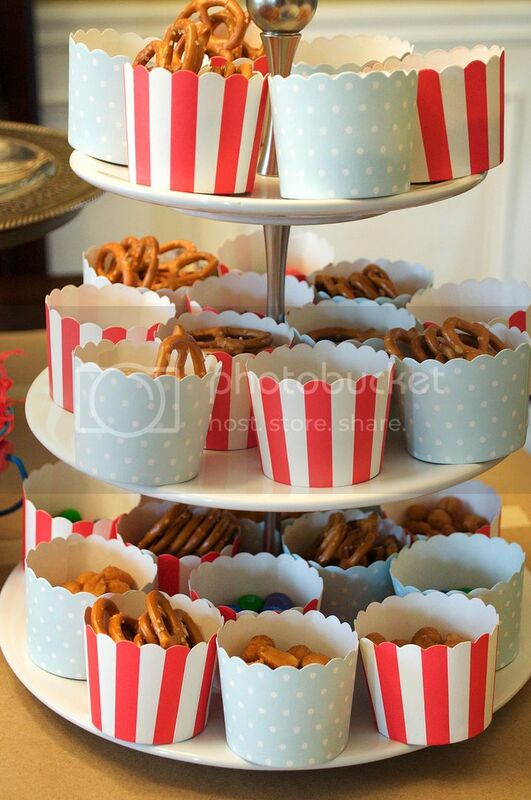 I served peanuts, pretzels and M&Ms in these cute little cups, and used a cookie cutter to make peanut butter and jelly sandwiches in the shape of a cloud. 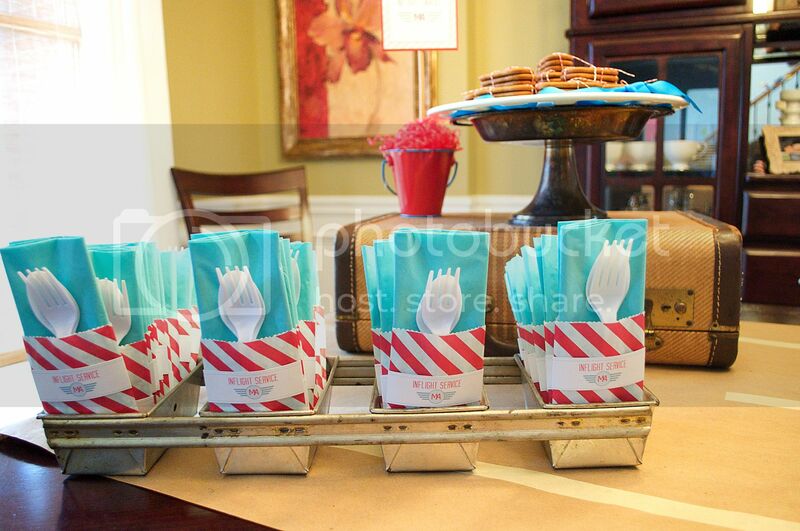 I ordered the little red and white striped cello bags, purchased napkins and utensils from The Dollar Tree, and designed the little utensil wraps to tie it all together. These came out so cute! 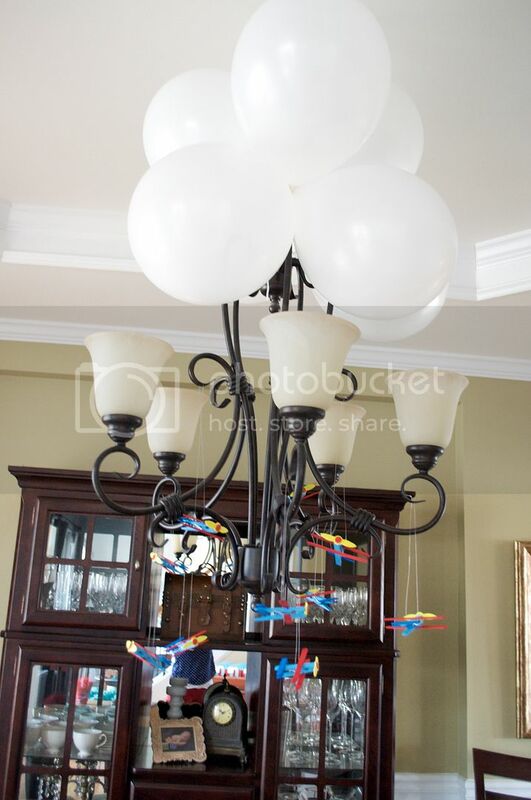 There were going to be a lot of little kids at the party, and I wanted to keep everyone downstairs. Addison helped me hang this sign on the stairs. It worked really well! 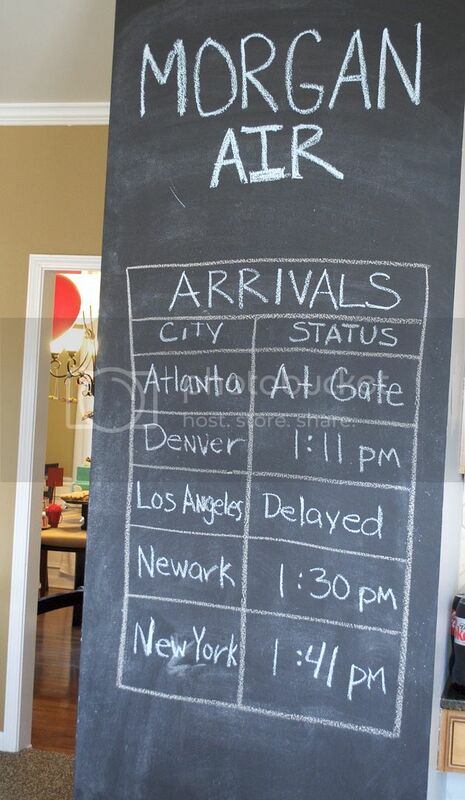 I was originally going to make a sign with the flight status on it. Ran out of time, but using the chalk board wall in my kitchen worked out even better! 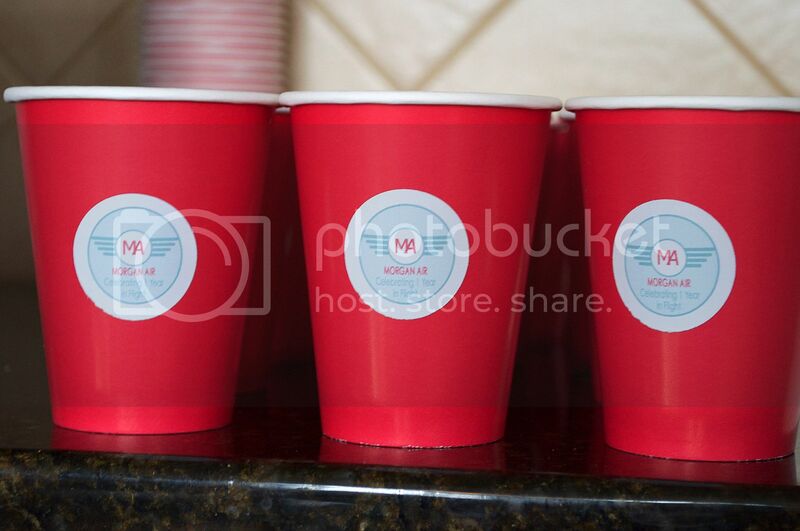 I bought el cheapo cups at the dollar store as well, but designed some cute stickers to put on them. 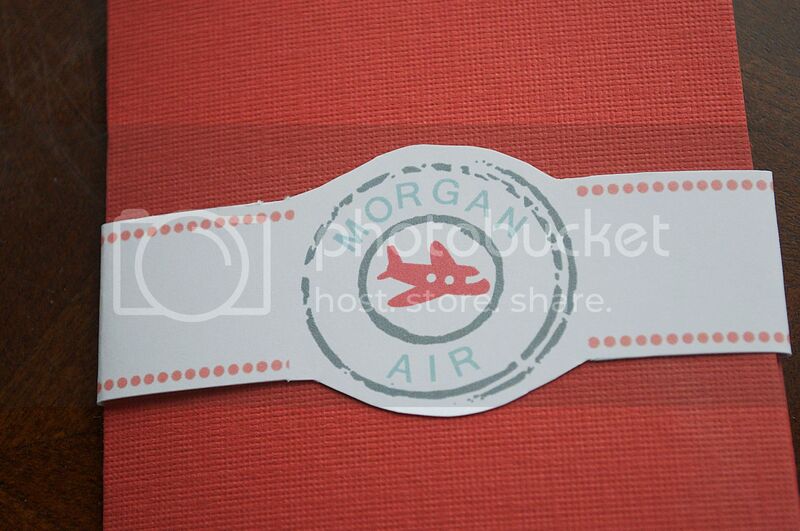 "Morgan Air, Celebrating 1 Year In Flight"! Finally, the piece de resistance...the favors! The red boxes were ordered online, and I put my paper crafting skills to work. I hand cut the straps and handles and hot glued them all to the boxes. 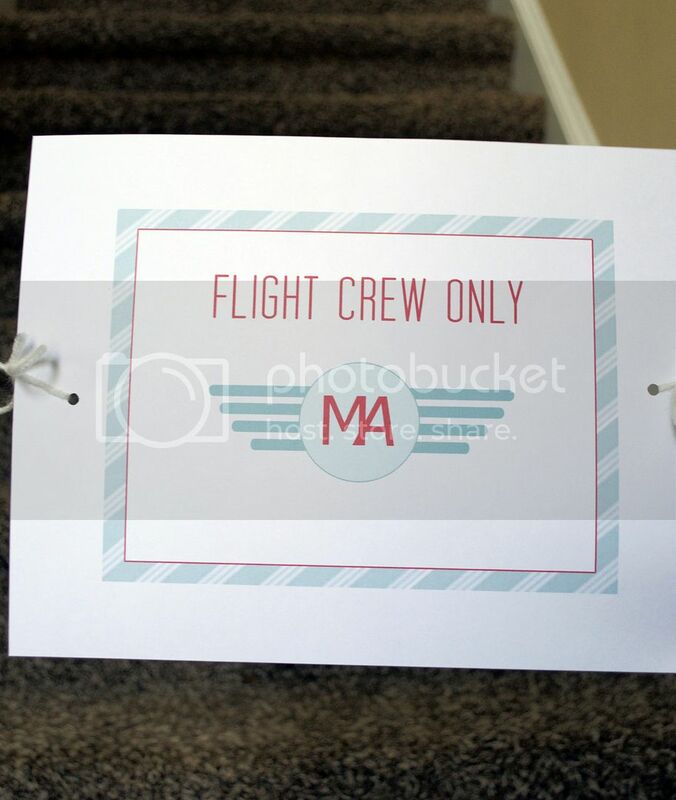 Inside, were individual packs of oreo cookies and an official flight pin so everyone could get their wings! 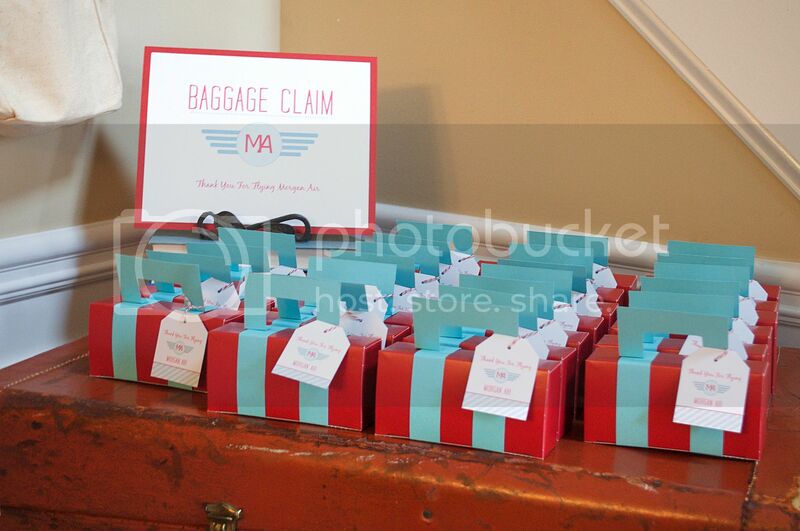 I set up the display in the foyer on a vintage trunk and some old vintage suitcases. The sign and tag were designed by me! 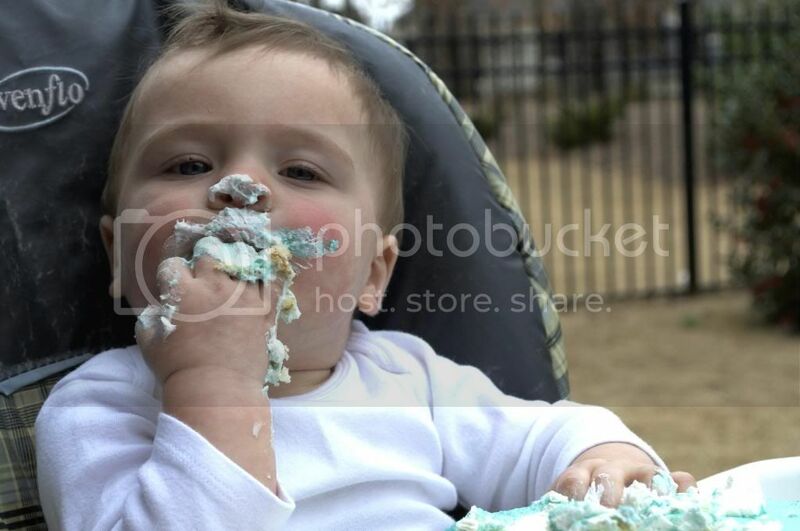 The rest are some fun pics of the birthday boy. 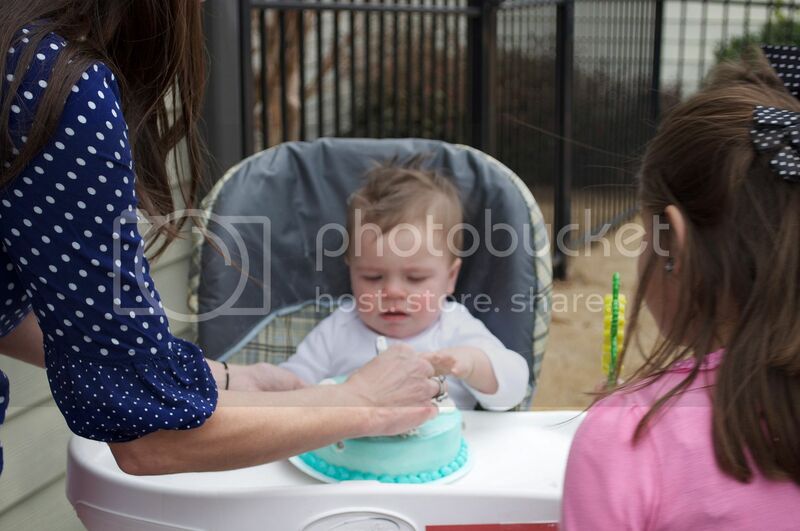 He was very hesitant about the smash cake at first, but before we knew it, he had polished off half the cake! I had to take it away from him so he wouldn't get sick. It was pretty darned cute! Our little family - look at that face! LOL. Little man had a great day! Now the only question is - what will I do next year? 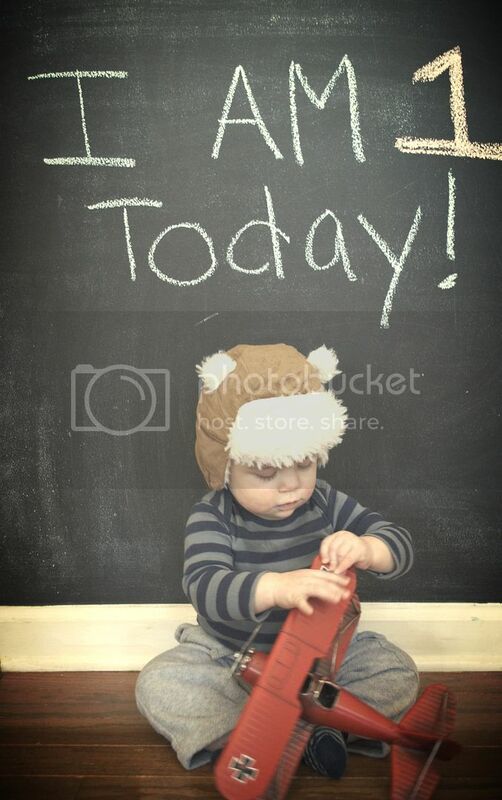 Posted by Jennifer at 7:59 AM 1 I would love to hear from you! 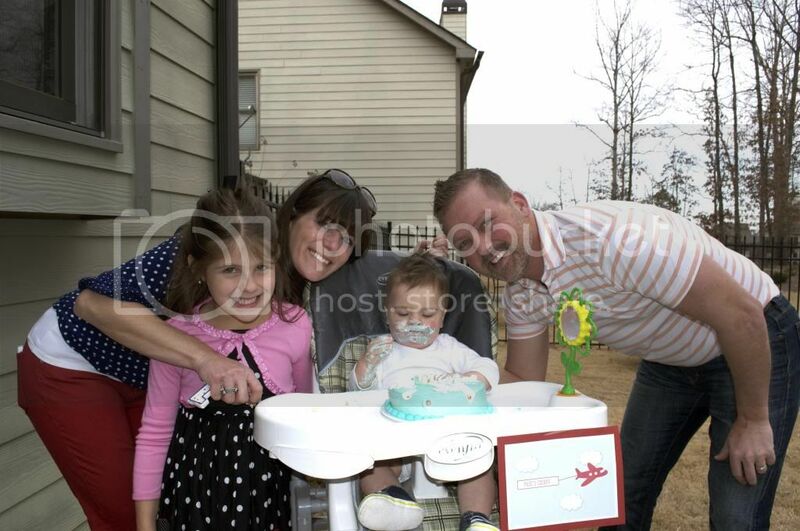 Back in March, we celebrated Morgan's 1st Birthday. 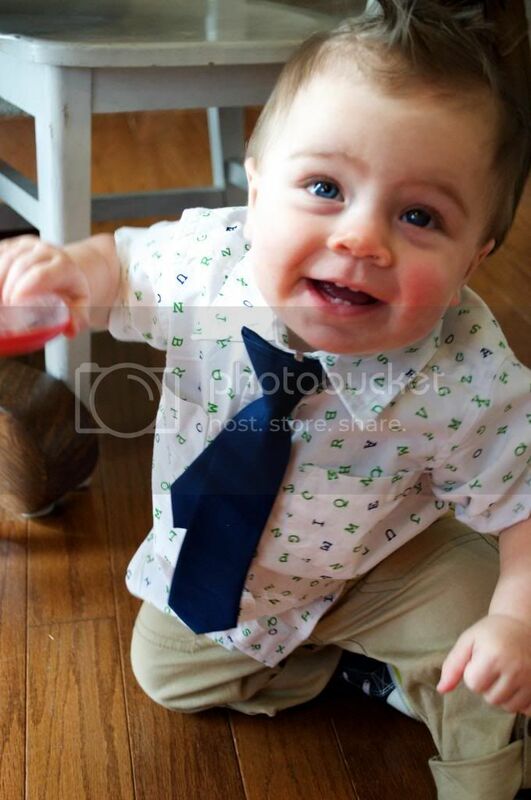 Almost 3 months later, and I still can't believe how much he's grown. 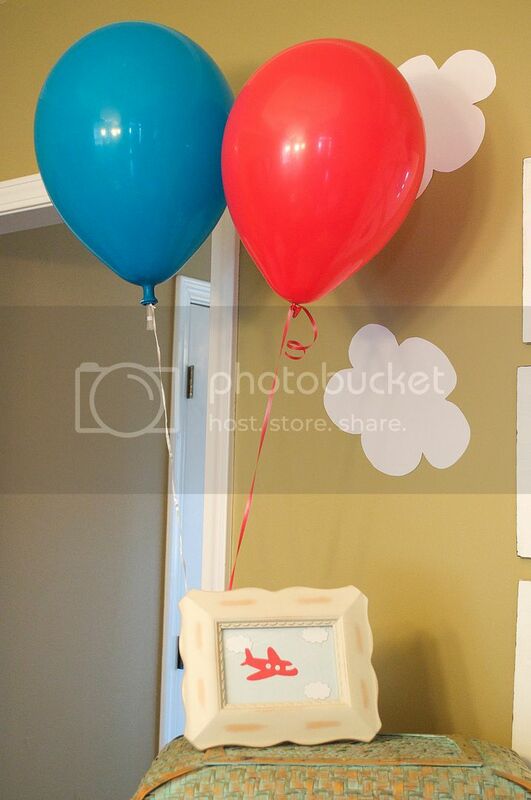 It's amazing how fast his first year went - which led me to the theme of his party...Time Flies! 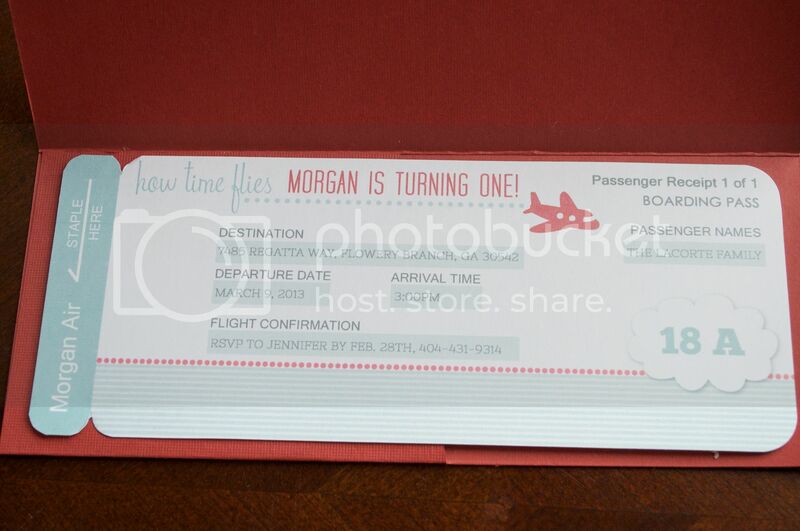 I've designed custom airline boarding pass invitations for clients in the past, and it seemed like the perfect way to announce his big day. 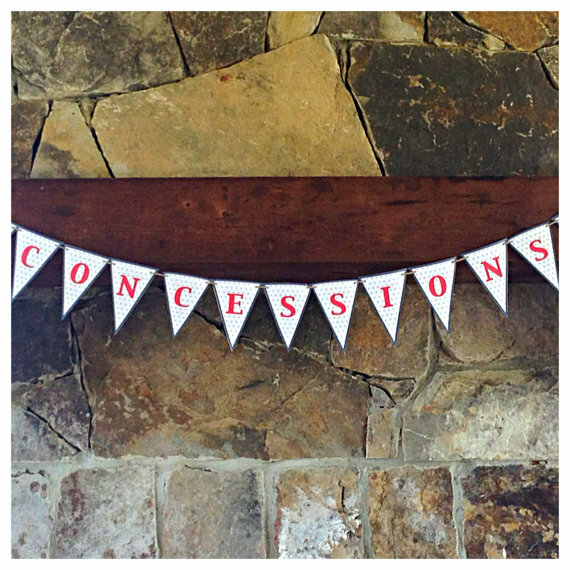 These pass holders take the invitations over the top. They're my favorite part - it makes them look so authentic! 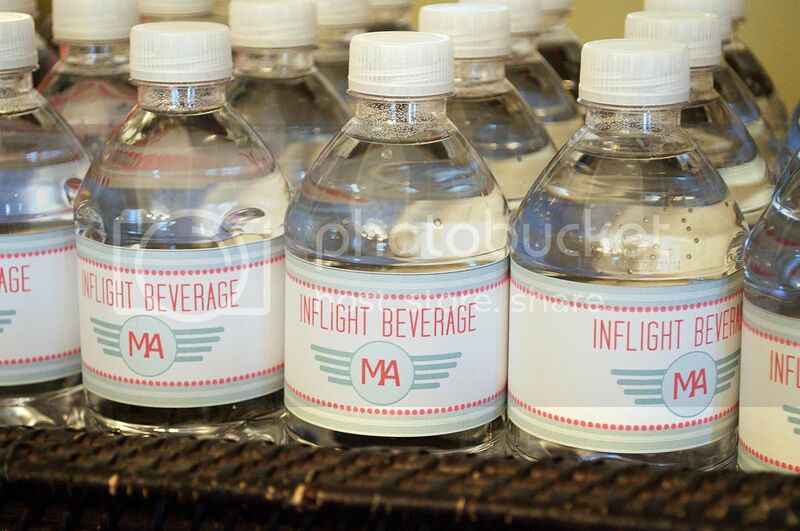 I love that each one can be personalized with the passenger name (I chose to do one per family). 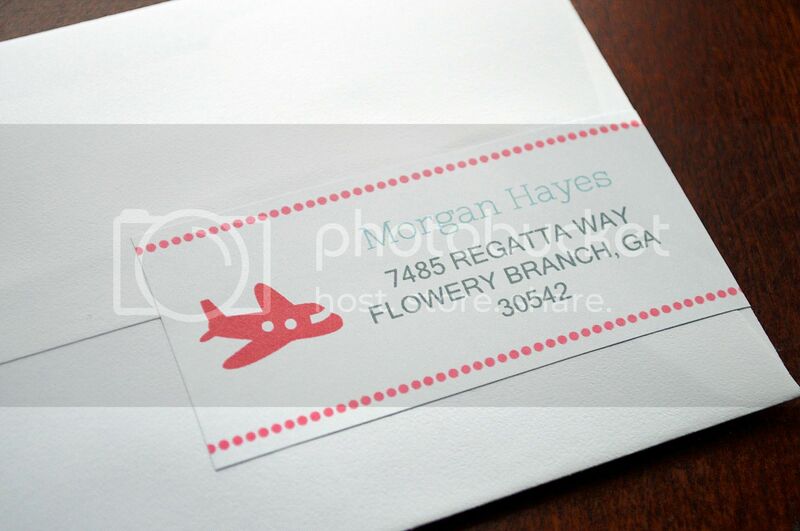 Last but not least, I designed wrap-around address labels to complete the look. 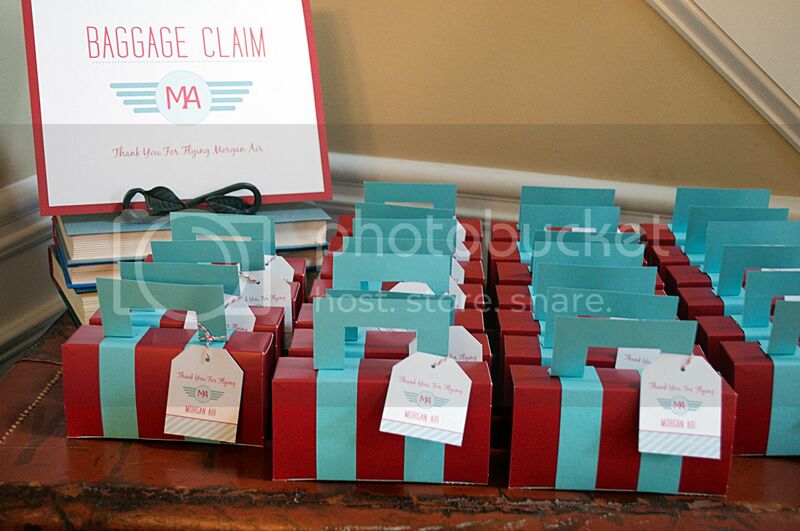 The feedback on the invitations was very positive - everybody loved them! 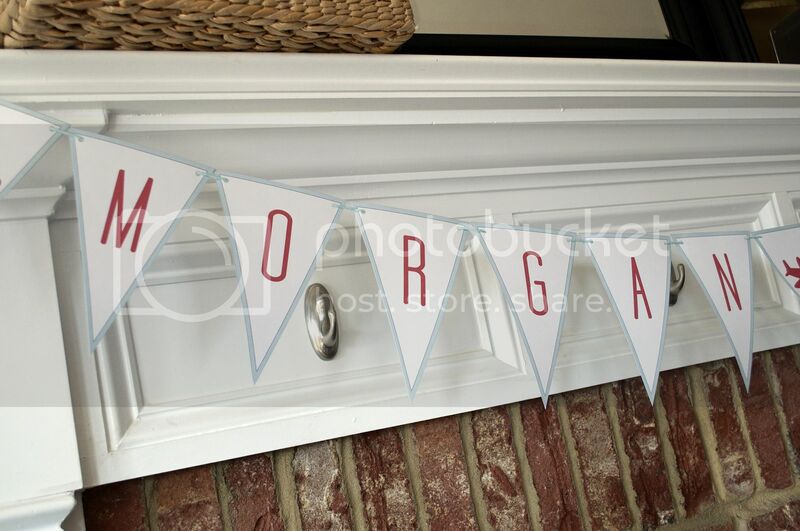 Stay tuned for more on Morgan's party - I will be adding the rest soon! Posted by Jennifer at 1:51 PM 2 I would love to hear from you!